I couldnt imagine being given up for dead in the death zone only to survive, what an amazing feeling it must be. This was the story of 2006 on Everest. Dan Mazur, his clients and sherpas are definite heroes. I also love this picture. Beautiful colors and composition! (Harry:)Thanks MC & Jeff. Though I must stress that it were the 7summits Sherpas who did the rescue. Without them Dan would not be a hero but would have been criticized for letting a person die, it is a thin line between fame and misfortune..
Harry…I did not phrase the above message properly, my apologies. (Dan Mazur only had one sherpa with him.) 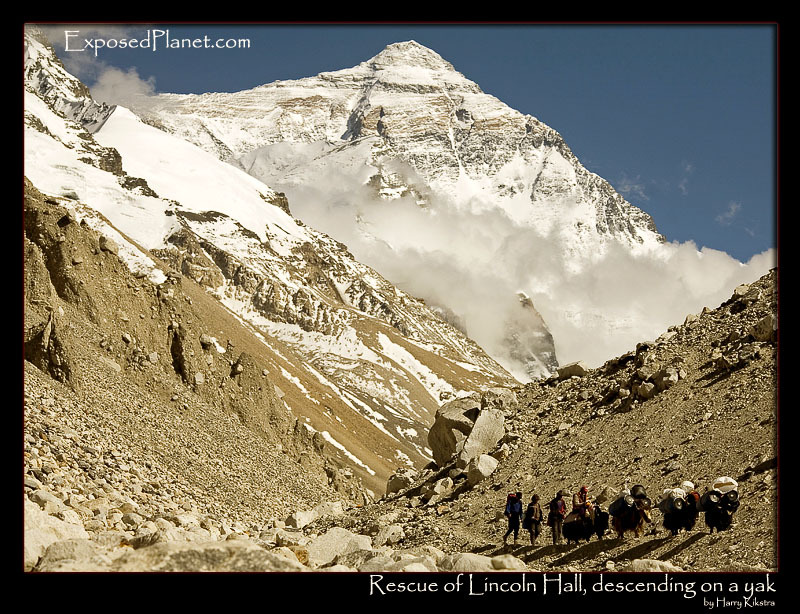 I absolutely know that it was the 7summits.com sherpas who saved Lincoln Halls life. I actually listed each one of their names on the 7summits.com open forum under the News-Lincoln alive post. They are the unsung heroes. Such a powerful image.. Great capture and nicely composed.. The story behind "Lincoln Hall on a yak after rescue on Everest"
Australian climber Lincoln Hall, descends back into basecamp of Everest on the back of a yak, accompanied by doctor Andrey Selivanov, who treated him at 7000m altitude.